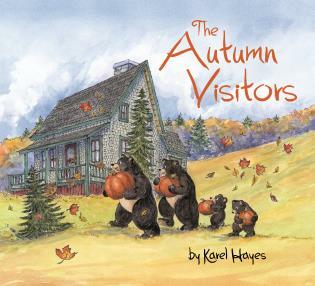 In this fourth and final book in Karel Hayes's acclaimed Visitors series, the beloved family of bears gets in another round of adventures as they experience the full enjoyment of a New England autumn. First up the country fair--the bears sneak onto the midway after hours to play the games and be thrilled by the rides. Next comes Halloween, for which the bears all cleverly disguise themselves to gather a load of trick-or-treat candy. And finally there's a big Thanksgiving feast for all the friends of the forest. As always, the bears manage to have all their fun while carefully avoiding detection. Watercolor artist and illustrator Karel Hayes has participated in solo, juried, and invitational exhibitions throughout the United States. Her paintings have been shown at the Cincinnati Museum of Natural History, the Fine Arts Center in Taos, New Mexico, and in New York City at the Salmagundi Club, the Catherine Lorillard Wolfe Art Club, and the National Arts Club. Her drawings have appeared in several magazines and she has illustrated more than ten books, including Time for the Fair, The Winter Visitors, and Who’s Been Here? A Tale in Tracks. She lives with her husband in Center Harbor, New Hampshire.